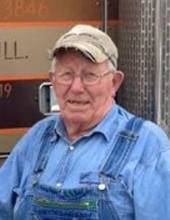 HENRY- Joseph Leon Mattingly, 93, of Henry, passed away at 1:07 PM Friday February 8, 2019 at Unity Point Methodist Medical Center ER in Peoria. A Mass of Christian Burial will be held at 10 AM on Wednesday February 13, 2019 at St Mary/ St. Joseph XXIII Catholic Church in Henry with Fr. John Bosco Mujuni officiating. Visitation will be held from 4-7 PM on Tuesday February 12 at Calvert-Johnson Memorial Home, 513 Carroll Street Henry, IL and 1 hour prior to mass at church. Burial with Navy Honors will be in St. Patrick's Cemetery in Henry. In lieu of flowers memorials may be given to the American Legion, 303 Main St Henry, IL 61537 or to the Honor Flight of the Quad Cities c/o Ridgecrest Village 4130 Northwest Blvd, Davenport, IA 52806. Leon was born in Stark County on August 28, 1925, a son to Hubert Sr. and Susan Buckler Mattingly. He married Jean Schlosser on November 25, 1947 in Henry. She survives. Also surviving are his 4 children, Sharon (the late Joe) Kessling, Henry, Joe (Diana) Mattingly, Peoria, Thomas L. Mattingly, Henry, Laura (Bob) Jackson, Tiskilwa; 10 grandchildren; 19 great-grandchildren; sisters, Sister Cecilia Mattingly, Peoria, Mary (the late Lloyd) Russell, Henry, Jim (Mary Jane) Mattingly, Henry; and many nieces and nephews. Leon served in the United States Navy. he graduated from Henry High School and was owner/operator of Mattingly Trucking in Henry for 70 Years. He will be sadly missed by all that knew him. Also 1 Hour Prior on Wednesday at church. "Email Address" would like to share the life celebration of Joseph Leon Mattingly. Click on the "link" to go to share a favorite memory or leave a condolence message for the family.